the stem cells from an unborn child are not yet specialized and are able to be used and manipulated better. these things are reproducible. and really needed. yeah. we should have bone marrow drives. i believe that through research there has been better outcomes with olfactory stem cells and umbilical cord stem cells. 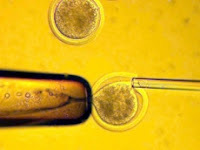 The stem cells from embryos simply have not showed as much promise as once thought; however, good old scientists desire to 'be thorough' to determine if they could meet unrealistic expectiations. Honestly, if the umbilical cord has stem cells that can be used and show more promise and does not cause an uproar from the prolife advocates, shouldn't we pursue this, instead of dividing because of the meaningless destruction of embroyos?